"Remember, anything is possible." Those are Logan's words to Amber, shortly after he meets her in the fancy restaurant where she works. Yes, anything is possible. It is possible that two souls meant to be together, continuously find one another, time after time. That even death does not destroy the connection the two souls have to one another. Death simply disrupts their time, until they can be together again. That is what happens between Logan and Amber. Logan is a rich entrepreneur who is seeking out his soul-mate. He knows her well. Her name, face and features may change, but the person inside and the connection they have cannot be broken. Logan is special. He is someone who loves with every ounce of his being. He traveled the world to find her. He remembers everything. When he finds Amber, he has to learn who she is now and help her to remember who they had been before. He's known her all his life and if he can convince her to give him a chance, he can help her to learn what love is and bring her to a place where she can have everything she's ever dreamed of. The only problem is explaining everything to her. Instead of just telling her, he goes about trying to show her and helping her to see the amazing truth herself. Amber feels a connection to Logan the moment she sets eyes on him. She can't explain it, but she is drawn to him. She agrees to spend time with him, not knowing who he is but feeling that she wants to understand him. They start off slow and Amber learns that Logan is a man with many talents and has a good heart. The more time they spend together, the more she questions everything. Logan shares some details with her, but yet she doesn't remember him. The closer the two become, the more Amber falls for him. If you've ever read a Nicholas Sparks book, you will enjoy Across Eternity. You will need a box of tissues at the end though because this love story is romantic and bittersweet. I won't spoil the ending or tell you too many details, because that would ruin it for you. I will just say that Ms. Whittier has created a beautiful story that engages the heart and makes the reader wonder about true love and soul mates. I felt my heart soar throughout the story and ache by the end. Bittersweet covers the essence of this story the best. Learn to love, learn to live, and learn to let go. These are the greatest gifts we can give to others. Live the life you heart begs for. Love the people in your life. When it's time, let them go from this place, knowing they are never truly gone. 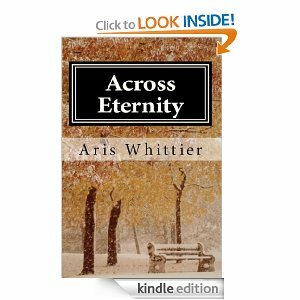 Want more Aris Whittier?? Check out her links below!